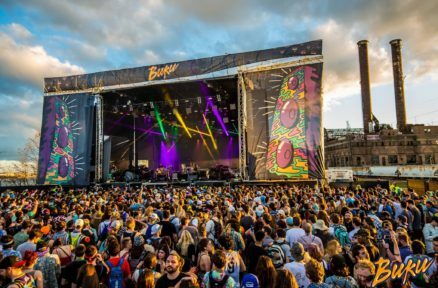 Sunset Music Festival just dropped one of the biggest lineups to kick off the 2019 festival circuit, and let’s just say, this one makes up for the misfortune of the 2018 tropical storm debacle. The mighty Disco Donnie crew set the bar for the rest of the region’s festival announcements coming with some eye-popping names like Dog Blood (Skrillex & Boys Noize), Kaskade, Destructo, Chris Lake, 12th Planet, and more. Over the past 6 years, Sunset Music Festival has grown to become a staple in the Tampa Bay dance music culture, and they have their foot on the gas with no signs of hitting the brakes any time soon. Last year the festival was unfortunately halted just after the first day due to a state of emergency issued by the state of Florida government over a would-be tropical storm Alberto. 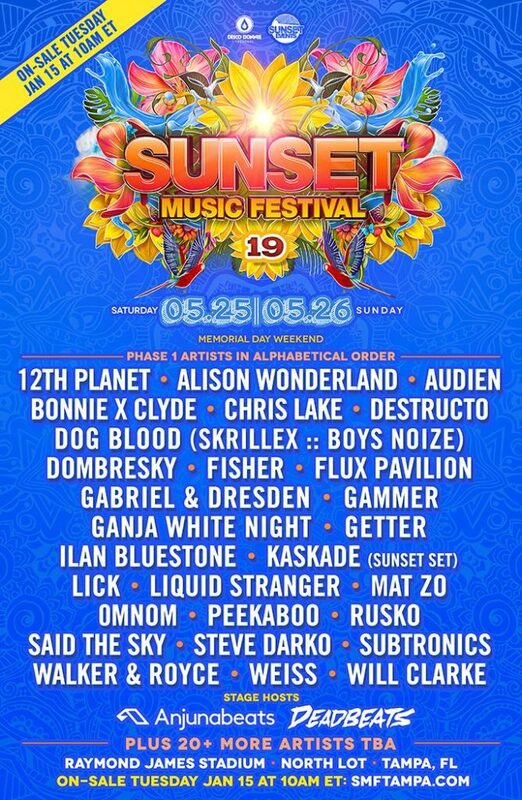 The folks behind Sunset Music Festival did not let this discourage them from coming back in 2019 to deliver a top-tier lineup that will surely win back the broken hearts of those attending in 2018. This lineup has a tasteful mix of all things EDM, and, for now, it will feature stage hosts from Anjuna Beats and DEADBEATS. Fans of anything from house to bass will rejoice under the Florida sunshine at Raymond James Stadium for a jam-packed Sunset Music Festival 2019. Anjuna Beats will be bringing names like Mat Zo, Gabriel & Dresden, and Ian Bluestone. There are even some noteworthy names from the beloved Dirtybird camp like Will Clarke, Walker & Royce, Fisher, OMNOM, and Steve Darko. Hopefully the unpredictable Tampa weather will grace us with a drama-free weekend for Memorial Day 2019 so we can see the full potential of this fast growing music festival. This phase one lineup looks great, and there are supposedly 20+ more artists to be announced in the near future for Sunset Music Festival. Buckle up, Tampa, we are in for quite the musical ride thanks to Disco Donnie Presents and Sunset Events this May. Early bird tickets and payment plans for Sunset Music Festival will go on sale Tuesday, January 15, which will be available at smftampa.com. See the full lineup below!